On November 9th, 2017 APEN hosted a webinar entitled, APIs Lead: Post-Legislative Session. 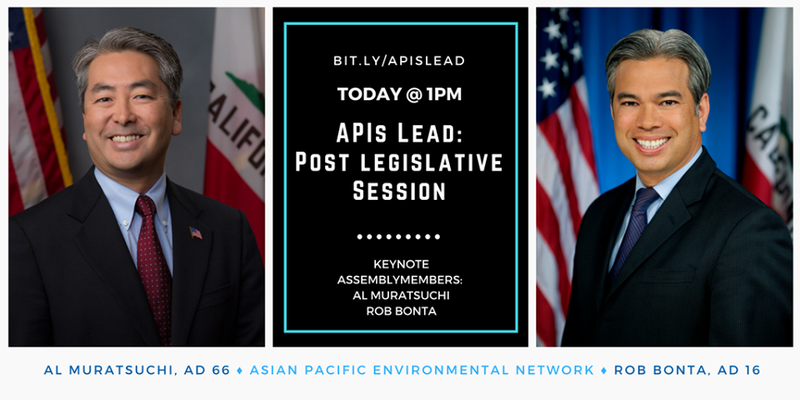 Assemblymember and Chair of the API Caucus, Rob Bonta along with Assemblymember Al Muratsuchi opened the webinar with keynote remarks. Assemblymember Bonta and Assemblymember Muratsuchi both highlighted the need for ongoing fights in the legislature around key issues impacting our communities given the current political climate. Approximately 30 API leaders throughout California attended the webinar. APEN in partnership with core allies such as Asian Americans Advancing Justice- Asian Law Caucus (AAAJ- ALC), the Southeast Asian Resource Action Center (SEARAC) and Housing Now highlighted key wins from this past year. Issues ranging from environmental justice to economic justice to immigrant rights and healthcare were a part of the central policy priorities for 2017. On the housing front SB 2, SB 3 and AB 291 passed. SB 2 in particular, was a major victory in that it is expected to generate $250 million per year for low-income housing development through a $75 tax per real-estate transaction. Immigrant rights was a hot button issue this past year. Given the current administration’s stance on immigration, California stood firm in it’s response and protections of immigrant communities by passing SB 54, also known as the California’s Values Act. Through SB 54, California became the first state in the country to pass a statewide policy around providing sanctuary for immigrant communities. Continued fights around environmental justice resulted in wins with the passing of AB 617, AB 523 and SB 51. AB 523 will ensure that 35% of clean technology investments will be allocated to real projects in environmental justice and low income communities. This will move communities on the forefront of pollution towards a just transition. California has the opportunity to lead the country around key issues such as environmental justice and immigrant rights, 2017 was a watershed moment for many API leaders and organizations. And as we look towards 2018, we know that it will be another year of building off the momentum of the previous year as we continue to shape California’s future. This entry was posted in Blog, front-page-updates and tagged APACC, api's lead, Just Transition, legislative session, Policy, webinar by Laiseng Saechao. Bookmark the permalink.